Save face—and disposable cartridges from going into landfills—with this clever sharpener. You're not into the lumberjack look, but you can't stop at the barber every morning, either. Save face—and expensive, disposable cartridges from going into landfills—with this clever sharpener, which extends razor life by 5-7 times. 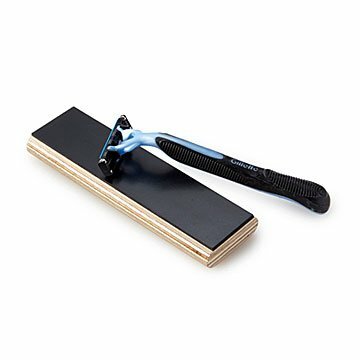 Just wet your razor, move the blades forward along the honing pad a few times, and you're ready for a shave as smooth as if you were using a new blade. The sharpener is made from nine-ply American plywood, and even the paper wrapper is USA-made. Works beautifully for women's razors, too. Handmade by Keith Brandman in California. Keith Brandman has been a woodworker for over 40 years and had always sharpened his chisels and plane irons using Japanese water stones. These stones work well but are very slow. After buying an electric sharpener, he decided to try and sharpen one of his razors. The sharpener destroyed it because it was too coarse. Keith kept trying finer grits until he got up to 3600. This sharpened the razor but resulted in a harsh shave. He next tried a leather stropping wheel and it worked great. Now, Keith just had to find something that would have the same resistance as the leather while not being too harsh and sent out for samples of every material he could think of. The rubber that Keith found was very good but he developed a treatment that made it work great. Of course, the treatment is the secret sauce. What a great product! I get my husband shaving stuff for his stocking every year, and this was a great addition. So nice to be able to sharpen disposable razor blades for more uses!